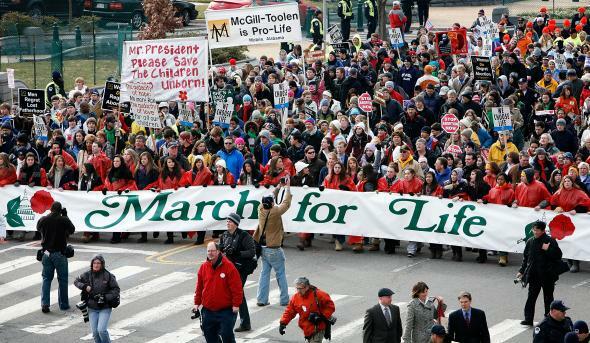 A judge rules that March for Life can cut off contraception access for non-religious reasons. The annual March for Life event on Jan. 22, 2010, in Washington. For most of 2015, it seemed that the assault on women’s right to contraception coverage had reached something of a stalemate. While last year the Supreme Court did find that even corporations have a right to cite religious objections to insurance plans that cover contraception, further efforts to reduce access to contraception have failed. The Department of Health and Human Services has created an accommodation that allows insurance companies to offer coverage directly to women without involving their employers, and efforts by employers to muck up the process have failed in the courts. But now anti-contraception forces have secured a new victory in the district court for the District of Columbia. Judge Richard Leon has ruled that the March for Life, an anti-abortion organization that organizes a yearly march against legal abortion in D.C., can cut off contraception coverage not for religious reasons, but for “moral” objections. March for Life holds itself out as a nonreligious organization, which is why they had to go this route. March for Life is trying to frame its objections to affordable contraception in terms of abortion, making the same tedious and utterly false argument that some kinds of contraception are equivalent to abortion. “It opposes methods of contraception that it says can amount to abortion, including hormonal products, intrauterine devices and emergency contraceptives,” the New York Times reports. At first blush, that might not seem like a big deal, but if you look at the HHS regulations, you’ll find that its objection actually covers all forms of listed contraceptions, with the exception of sterilization and the diaphragm. As legal expert Ian Millhiser explains at ThinkProgress, the decision is “hard to follow” due to its use of pretzel logic, including the argument that religious exemptions to laws discriminate against nonreligious employers. Leon “appears to object to the government’s decision to exempt churches and other inherently religious organizations from the birth control rules,” Millhiser writes, “without also extending this exemption to secular employers because such a rule discriminates against secular employers.” Since the Supreme Court has already held that you can’t just run around refusing to obey any law you want by simply invoking vague “moral” objections, I wouldn’t bet on this decision holding up on appeal. Still, this decision is an important one because it blows the doors off the claim that anti-choice objections to contraception coverage are about “religious liberty” or “religious conscience.” Instead, the lawsuits over Obamacare appear to be another variation of the anti-choice movement’s “incrementalist” strategy, which has been employed for decades to reduce access to abortion. Instead of trying get an absolute abortion ban passed, which would likely never happen, the anti-choice movement chips away at access by passing a bunch of small regulations, hoping to bury women and providers in so much red tape that they simply give up. A look at the big picture shows the same thing is going on with contraception: Anti-choicers are trying to chip away at all the means and methods women use to get contraception, hoping to make the price and hassle too much for women to overcome. The summer’s attacks on Planned Parenthood, while ostensibly about abortion, in fact resulted in Republicans defunding or attempting to defund contraception services—while leaving abortion services, which are privately funded, untouched. A similar dynamic appears to be going on with these lawsuits, with each one trying, bit by bit, to expand the power of employers to stop women from obtaining affordable contraception.